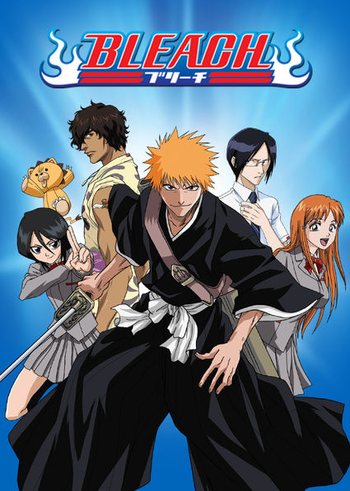 Left to right: Rukia Kuchiki, Yasutora 'Chad' Sado, Ichigo Kurosaki, Uryu Ishida, and Orihime Inoue. "We stand in awe at that which cannot be seen." Ichigo Kurosaki would have liked to have been an Ordinary High-School Student. Unfortunately, his ability to see and hear ghosts (and his orange-colored hair) kept getting in the way of a normal life. This is all he knows of the spirit world until the day he encounters Rukia Kuchiki, a Soul Reaper whose profession requires her to destroy evil spirits ("Hollows") and send good spirits ("Pluses" or "Wholes") to the afterlife. When Rukia is injured while trying to slay a powerful Hollow about to kill Ichigo and his family, she offers the boy a portion of her powers to defeat it in her place. Unfortunately, his abnormally-high amount of spiritual energy absorbs all of her power instead, forcing him to take up her duties until she can recover and return home. What follows is adventures within the realms of the spirit world and facing the dangers that produce them. Written by Noriaki "Tite" Kubo, Bleach starts off as a quirky Urban Fantasy action-comedy, but soon becomes a much more standard Shōnen Fightin' Anime with the start of the Soul Society arc. In it, Rukia is arrested by her fellow Soul Reapers for the crime of transferring her powers to a human, and taken back to the afterlife ("Soul Society") to be executed. Naturally, Ichigo wants to mount a rescue. Training montages, Next Tier Power Ups and ridiculously complicated plans ensue. This arc is infamous for introducing Loads and Loads of Characters (tripling the previous cast; Kubo himself has admitted that his solution to writer's block is to create new characters), drastically changing the formula and tone of the series, and for its sheer length, which coined the meme, "Are they still in Soul Society?" That said, this change of direction has led to not only one of the most ludicrous dramatic moments in manga history, but many an awesome moment as well, and its continued popularity speaks for itself. Hell, it even has musicals! For most of its run, it was one of the "Big Three" long-running shonen manga/anime in serialization, and it inevitably gets compared to its colleagues, as well as Dragon Ball (which Kubo is inspired by) and YuYu Hakusho (which shared the same director). It's also notable for having one of the largest Periphery Demographics in the history of shonen manga — it has not so much an Estrogen Brigade as an Estrogen Legion. After 10 long years, the manga officially entered its final arc, which began on February 8, 2012 and was confirmed that the series would end with Volume 74 . The anime ran 7 1/2 years, from October 5, 2004 until March 27, 2012, after the completion of the manga's penultimate (Lost Agent) arc, giving way to the Naruto spinoff Rock Lee's Springtime of Youth. In August 2016, after 15 years and 686 chapters, Bleach became the second of the Big Three to end. Some plot points were further expanded upon in Bleach: We Do Knot Always Love You and Bleach: Can't Fear Your Own World. In July 2018, Kubo released a one-shot spin-off manga called BURN THE WITCH; set in London, England and dealing with the Western Branch of Soul Society. See the recap section for more. The English dub is licensed by Viz Media and aired on [adult swim] (later, Toonami) from September 8th, 2006 and ended its run on November 1st, 2014. During its run, Bleach has had two live action adaptations planned. On February 22, 2012, Warner Bros. Studios announced the licensing and planned development of a live-action Hollywood movie although plans for that seem to have fallen through the cracks. However with the release of the final chapter on the 18th of August 2016, Tite Kubo himself confirmed that a Japan-produced live-action film adaptation would be released some time in 2018 . The movie, simply titled Bleach was released in theatres on June 20, 2018 in Japan and distributed worldwide by Netflix on September 14, 2018. Bleach is amongst those few anime that earned its own Die For Our Ship, Ho/Foe Yay and Fan Nickname pages. It also has fifteen character sheets. It now has pages discussing one of its DS outings, Bleach: The 3rd Phantom, and the Light Novels: The Death Save the Strawberry, We Do Knot Always Love You, and Cannot Fear Your Own World. Note: This article is not about a laundry detergent or the Nirvana album. Sorry. It also (usually) has nothing to do with Brain Bleach ("We stand in awe at that which cannot be unseen"). Please revamp the main trope pages by moving all character tropes to their respective characters. If you haven't read the manga, there are major spoilers below. Flash Step: A favorite combat maneuver of most Soul Reapers (called Shunpo in Japanese). The Arrancar have their own move called Sonido, the Quincy have Hirenkyaku, and the Fullbringers have Bringer Light. Despite the different names (and claims by various practitioners that their version is better), the only apparent difference between them is the sound effect each one makes, with the exception of Bringer Light which emits a green flicker. This is even Lampshaded by Gin Ichimaru in one of the omakes (before the introduction of Bringer Light). Show me your bankai, TV Tropes!